The UNESCO listed Museuminsel includes five museums housing a number of national, internationally renowned collections of antiquities from around the world. Whether you want to see the collections in only one/two or want to see as much as you can, there are a number of ticketing choices available. From single entry tickets to each of the museums to passes and cards for the Museum Island five as well as the other museums and attractions in and around Berlin. Having tested them all, Thomas weighs up the options. The information on this page was last checked and/or updated on 22 April 2019. Passes and Card Options: A. 1-Day Museuminsel Pass B. 3-Day Berlin Museum Pass C. Berlin WelcomeCard D. Berlin WelcomeCard Museuminsel E. Berlin Pass F. Which Card or Pass? F. Which Card or Pass? Looking across the Spree River to the Alte Nationalgalerie on Museuminsel. The northern section of the island in the Spree River, as it flows through the Mitte district of Berlin, is known as Museuminsel. Today it is home to five of the most outstanding museums in Berlin. When the James-Simon-Gallerie opens, which will act as the visitors centre, there will be close on 200 years of museum architecture on the island. Together these museums display collections of prehistoric artefacts to the objects of 19th century, from many areas throughout the world. The Altes Museum was the first to be erected. Early in the 1800s King Friederich Wilhelm III of Prussia decided that the royal collection of ancient art should be on public display. Designed by Karl Friederich Schinkel, the Königliches Museum was opened in 1830. In 1841 it was renamed when Friederich Wilhelm’s son declared the island an area of art and science, and the Neues Museum was constructed. These four photographs show the incredible range of artefacts and objects in the collections in the museums on Museuminsel. 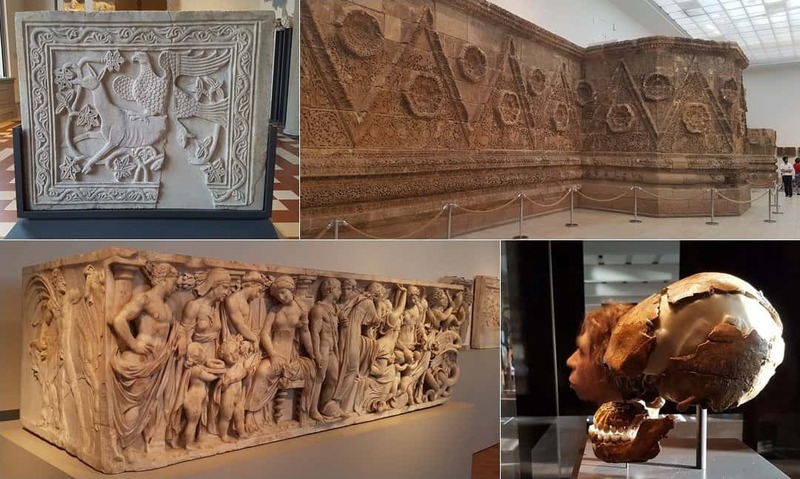 From top left, clockwise: a slab from a chancel screen from 12th century Constantinople in Turkey (Bode-Museum); Desert Palace of Mashatta in Jordan (Pergamon Museum); Neanderthal skull from Le Moustier in France (Neues Museum); the Medea Sarcophagus from Rome in Italy (Altes Museum). During the early stages of World War II, the collections left the island for safety. After the war, and following the division of Berlin, so too were the collections divided. Museuminsel was located in East Berlin, but had suffered significant damage during World War II. Some of the museums were restored, but it was not until the unification of Germany did all artefacts return to Museuminsel. There followed a significant re-organising of the collections and exhibitions, as well as a substantial programme of renovation and development. Four of the five museums will be connected by an ‘archaeological promenade’. Located at the basement level of each museum, this promenade will not only physically connect the great archaeological collections of these museums, but it will also provide a thematic connection between the collections displayed in these museums. The idea of connecting the museums and their collections was part of the original plans for the island dating back to the mid 19th century. The physical bridges and walkways were so destroyed during World War II that they were demolished and not rebuilt. In 1999 during the creation of a new masterplan, the idea of creating connections via basements was developed. Parts of this promenade are still under construction. So significant are the collections and indeed the buildings in which they are exhibited, Museuminsel was added to the UNESCO list of world heritage sites in 1999. Buying a single entry ticket for each of the museums is possible. Also, a number of passes, from one day to three days, are also available. Rome - Faces of the Empire, one of the galleries of Classical art in the Altes Museum. The Altes Museum was the first of the five museums, built between 1823 and 1830. The building is itself an important example of Neoclassical architecture. The entrance of sweeping steps leading to 18 monumental columns and on to a grand staircase and the rotunda based on the Pantheon in Rome. These are architectural features that were until this period reserved for the residences of royal palaces. Exhibitions are spread over two floors. The first floor has 12 galleries displaying art from ancient Greece beginning with the 10th century BC and ending with the 1st century BC. On the second floor are eight galleries displaying Etruscan and Roman Art. The collection of Etruscan objects is the largest outside of Italy. Do not miss the striking Green Caesar and Cleopatra. 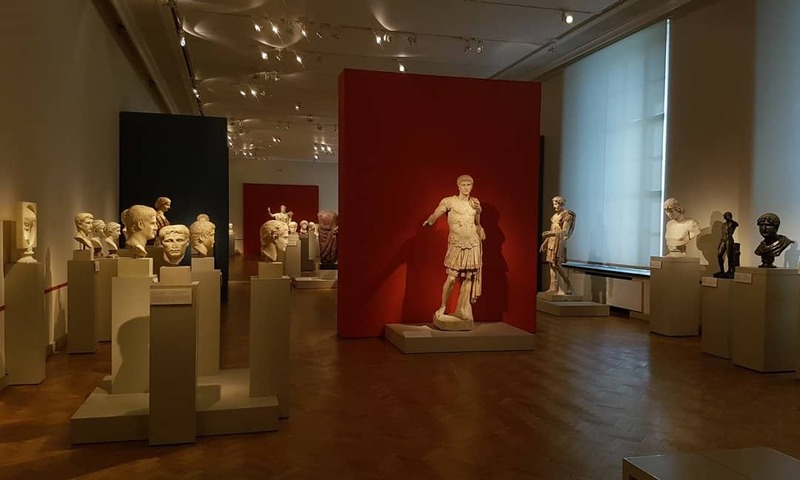 The final gallery has a wonderfully innovative display of the history of the Classical Collection on display in the Altes Museum. On display in the Altes Museum houses are the Staatliche Museen zu Berlin's Collection of Classical Antiquities (Antikensammlung), which includes Greek, Etruscan and Roman art, and the collections of antique coins, Numismatic Collection or the Münzkabinett. The price for the Altes Museum for one adult is €10 on entry. This can be purchased online, in advance for no extra cost - giving you skip-the-line entry to the Altes Museum. Good to have at any time of the year, even in winter. The Age of Bronze by Auguste Rodin, one of a number of French Impressionists on display. The Nationalgalerie is one of the most significant collections of the State Museums in Berlin, a collection of artworks from 1800 to the present day. This collection is on show at several locations around Berlin; the 19th century is housed in the Alte Nationalgalerie on Museuminsel. The museum was built between 1867 and 1876 with a mix of late Classicism and early Renaissance styles. The main features of the building - the church-like apse, the theatrical grand staircase and overall look of a Roman temple - were used to show that there was a unity of art, nation, and history. History and nation is further alluded to with the equestrian statue of Frederick William IV at the top of the stairs, while inside the staircase you can see a frieze depicting principle figures of German history from prehistoric times to the 19th century. Artworks are displayed over three levels, the first exhibits Classical sculpture, the second Idealism, Realism and Impressionism, and the third Neo-Classicism and Romanticism. The price for the Alte Nationalgalerie for one adult is €10 on entry. This can be purchased online, in advance for no extra cost - giving you skip-the-line entry to the Alte Nationalgalerie. A 6th century AD mosaic from an apse in San Michele in Africisco, Ravenna. Built between 1887 and 1904, the Bode-Museum was until 1956 known as the Kaiser-Friedrich-Museum. Initially intended to house the Gemäldegalerie - the collection of Old Master paintings - and sculptures of the Christian era. Although some 'Old Masters' remain in the museum, the Gemäldegalerie is now located at the Kulturforum. Three major collections of the State Museums in Berlin make up the galleries in the Bode-Museum. 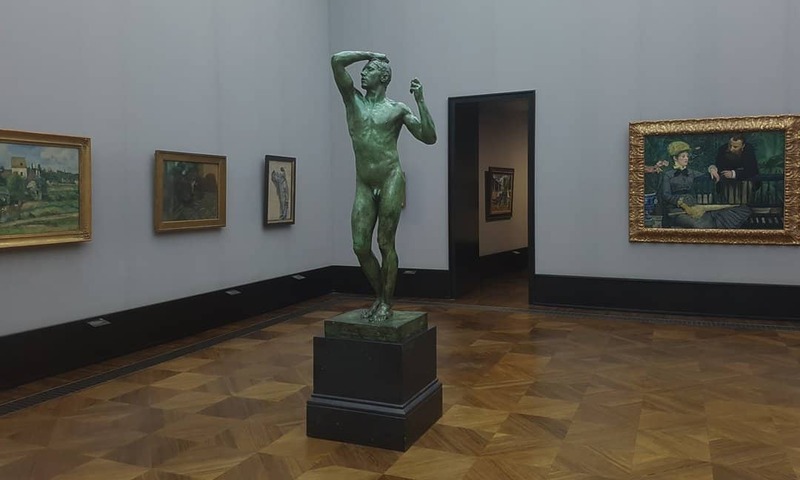 The Skulpurensammlung, which includes the largest collection of sculpture in existence from the Middle Ages to the 18th century and includes works by Donatello, Tilman Riemenschneider and Antonio Canova. 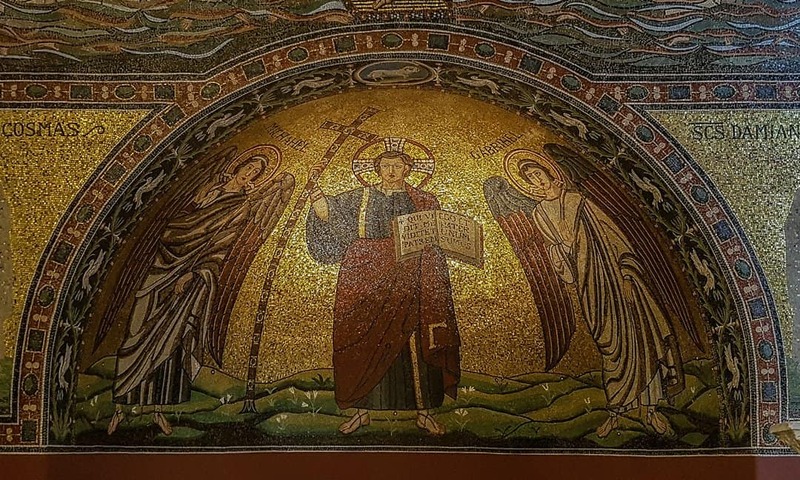 The Museum of Byzantine Art has an extraordinary range of Late Antiquity and Byzantine art, from the 3rd to the 15th centuries. And finally, the Numismatic Collection has over 4,000 coins and medallions, the oldest from the 7th century BC to currencies of today. The price for the Bode Museum for one adult is €12 on entry. This can be purchased online, in advance for no extra cost - giving you skip-the-line entry to the Bode Museum. The Egyptian Courtyard in the Neues Museum, remnants of the original artwork survived damage during the war. Neues Museum was the second museum on Museuminsel, having been built between 1843 and 1855. The building is considered a major landmark in 19th century museum construction and technology, applying building techniques made possible by industrialisation, such as the use of a steam engine to sink pilings into the river bed for the buildings foundations. Although partly destroyed during the second World War, other museums with similarly Neoclassical and ornate interiors, the Glyptothek and Alte Pinakothek in Munich, were much more severely destroyed in World War II. The Neues Museum then gives us one of the last remaining chances to see German interior museum layout from the 19th century. Initial restoration was carried out in the 1980s, but the most substantial renovation and refurbishment took place between 2003 and 2009, under plans from the British architect David Chipperfield. Spread over 4 levels are displays from Scandinavia to North Africa, from the Atlantic to the Middle East; from prehistory to the Middle Ages. Perhaps one of the most well known artefacts is the bust of Nefertiti, but there are many other equally striking objects, including the Bronze Age 'Berlin Golden Hat', the Xanten Youth, and Berlin Green Head. Amongst the oldest is the Neanderthal skull from Le Moustier near Les Eyzies in the Dordgne (France). 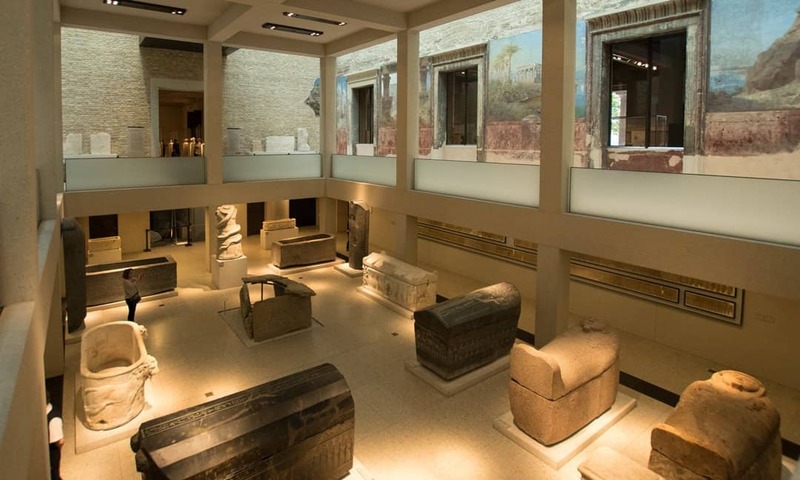 The displays in the Neues Museum draw on the Staatliche Museen zu Berlin’s Egyptian Museum and Papyrus Collection, the Museum of Prehistory and Early History (the Museum für Vor- und Frühgeschichte) and the Collection of Classical art. 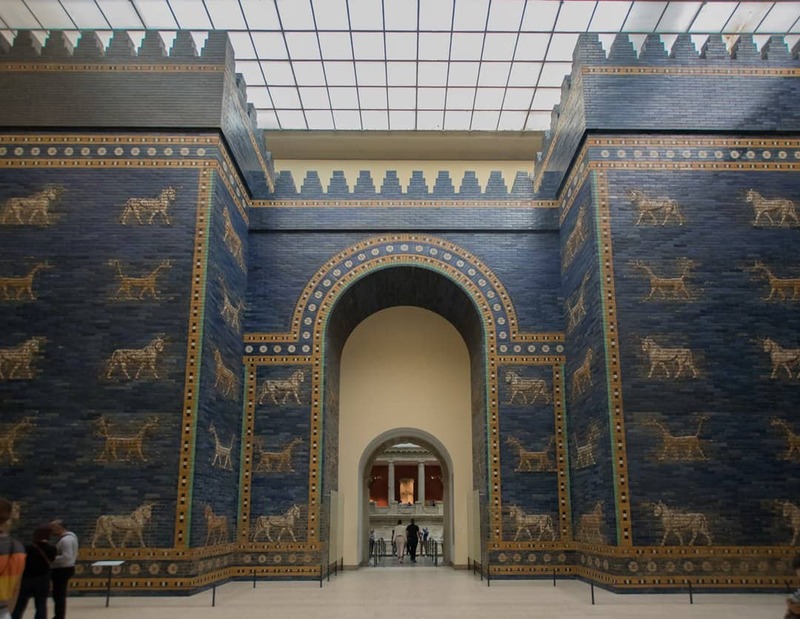 The reconstructed Ishtar Gate in the Pergamon Museum. The Pergamon Museum is the most recent of the five museums to have been built on Museuminsel, between 1910 and 1930. When constructed three wings in a U-shape housed three collections of the State Museums in Berlin. They are the Collection of Classical Antiquities, the Museum of the Ancient Near East and the Museum of Islamic Art. The Museum is currently undergoing major refurbishment, the U-shape being closed with the addition of a fourth wing. The Pergamon is well known for its reconstructions of monumental buildings. Two of the monumental structures in the Classical collection are the Pergamon Altar and the Market Gate of Miletus. The altar is not accessible to the public while building proceeds, a tentative date of 2023 has been given for the re-opening of the Pergamon Altar gallery. Over 6 millennia of Near Eastern history is covered with some 500,000 artefacts. Most of these obtained for the collection by German archaeologists working at the important sites of Babylon, Assur, Uruk and Tell Halaf. The highlight of this collection is the reconstruction of the Ishtar Gate and Processional Way. The collection of artefacts in the Museum of Islamic Art is one of the largest in the world. On display are artefacts from the 7th to the 19th century, the highlight of which is a portion of the façade from the caliphate palace of Mshatta. The price for the Pergamon Museum for one adult is €19 on entry, this includes the Pergamon 360° Panorama Experience. If you only want to visit the Pergamon Panorama, you have to buy the €19 ticket. Similarly, if you only want to visit the Pergamon Museum, it is €19. Besides the usual city passes available for Berlin, there are a couple of passes available for those visitors who want to see as many of the museums on Museuminsel as possible. If you only have one day and want to see 2 or more of these museums, then this is the ticket for you! This one-day pass gives you multiple entry to all five of the museums for one day (not 24 hour period) for €18.90 only. All you have to do is visit at least two of the museums and you have covered your cost. Visiting all five in a day can be done - but you will be only looking at highlights. On my second visit to Museum Island I did get to see all five in one day. It was a long day, but with a lunch break it was doable. Besides visiting the Altes Nationalgalerie and the Bode Museum for the first time, there were specific objects I wanted to see in the other three. Please note: if you want to visit the Pergamon Panorama 360° experience, you will have to show your Day Pass and pay an extra €6 per adult. You can buy your ticket at any of the ticket desks in each of the five museums, but you will then be standing in a queue. You have to buy the ticket on the day you intend to use it - you can not buy the ticket today for tomorrow. Alternatively, you can Buy the Ticket Online, in Advance. Instructions for this ticket state you can only skip the line for the Altes Museums, the Altes Nationalgalerie and the Bode Museum. That you have to get in the queue at the ticket desks for the Neues and Pergamon Museums to get a timed entry. Tip: I waited for the end of the day for these two museums, and did not have any problems getting in. If you are visiting at a busy period, I recommend going to the two ticket desks and booking your time-slot for the Neues and Pergamon before setting off to see the others. If you have more than a day for museum sightseeing in Berlin, and will want to see some of the other wonderful museums open in the city, there is another option. For €29 you can get a three-day pass for over 30 museums, including the five on Museuminsel. The range of museums included in the scheme is good. Multiple entries to the museums are not permitted. But given the prices of single entries to the Museum Island five, you only have to visit three to recover your outlay - and you have three days to explore these museums, and others, at a less breakneck speed. Alte Nationalgalerie, Altes Museum, Anne Frank Zentrum, Bauhaus-Archiv Berlin - Museum für Gestaltung, Berliner Medizinhistorisches Museum der Charité, Berlinische Galerie, Bode Museum, Bröhan Museum, Brücke Museum, Deutsches Historisches Museum, Deutsche Kinemathek – Museum für Film und Fernsehen, Deutsches Spionagemuseum Berlin, Deutsches Technikmuseum, Science Center Spectrum, Ephraim-Palais, Gemäldegalerie, Georg Kolbe Museum, Hamburger Bahnhof – Museum für Gegenwart – Berlin, Jüdisches Museum Berlin, Knoblauchhaus, Kunstbibliothek, Kunstgewerbemuseum, Kupferstichkabinett, Märkisches Museum, Museum Berggruen, Museum Europäischer Kulturen, Museum für Fotografie, Museum für Kommunikation Berlin, Museum für Naturkunde, Musikinstrumenten-Museum, Neues Museum, Nikolaikirche, Pergamonmuseum, Sammlung Scharf-Gerstenberg, Schloss Köpenick. This 3-day pass only gets you entry to the participating museums listed above. There are no additional benefits for passholders, such as travel on public transport. Berlin has quite an extensive WelcomeCard for between 2 and 6 days. The card is available for either 48 hours, 72 hours, four, five and six days; and each of these comes with a substantial free guidebook. Besides substantial discounted entry to various activities, attractions and museums (over 200 of them), each card also has unlimited travel on all forms of public transport in the city - including trams, the S and U-Bahn networks and buses. For transport, each card is available with either zones A and B, or A, B and C). So, you not only get to choose how long you want the card for, but also which of the two transport zone options you require during your stay. As of April 2019, a 48 hour card for zones A&B costs €20 per person, whereas a six day card with zones A,B and C included costs €47. The Welcome Card Berlin described above does not include entry to the museums on Museum Island. 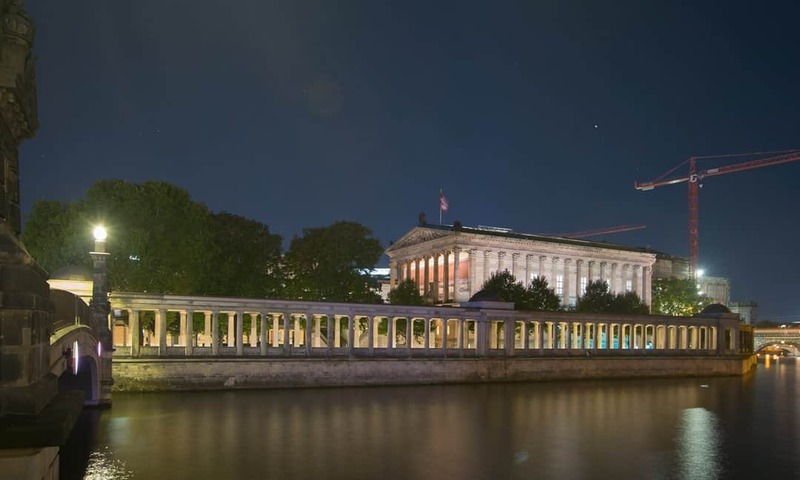 The Berlin WelcomeCard Museum Island, available for 72 hours gives you the benefits of the standard WelcomeCard plus for three days free entry to the the museums on MuseumInsel. You are able to visit each of the five museums once on each of the three days your card is valid for. But do note, you will have to pay extra for any temporary exhibitions that might be showing at the time of your visit. If visiting that exhibition is optional (i.e. it is located in a separate set of galleries), you can decide whether or not to see it, and whether or not to pay the top up. As of July 2017, a pass including zones A&B costs €46.00 per person. For two Euros more (i.e. €48), you get the card that includes zone C - a must to visit Potsdam. More Details, User Reviews and Buy Online. Another popular multiple attraction ticket is The Berlin Pass. Starting at 124€ for an adult for three days without travel or 148€ for three days with travel, this card is obviously much more expensive than other passes. The main difference between the Berlin Pass and the Berlin Welcome Card is that with the latter you only get discounted entry. Whereas with the Berlin Pass, besides an excellent city guide and the option of adding public transport for the duration of the ticket, you get full entry to over 60 top attractions and a hop-on-hop-off bus tour of Berlin, including Museuminsel's museums and Berliner Dom. Some of Berlin's finest museums are included, including the Jewish Museum Berlin, the Anne Frank Museum as well as all of the museums on Museuminsel. Given that such attractions as the Berlin Dungeons, Madame Tussauds, AquaDom & SEA LIFE Berlin and the LEGOLAND Discovery Centre are included, the Berlin Pass is great for families. Follow this link for a full list of participating attractions. SALE €25 off all Berlin Pass options from 11 April to 17 April 2019. €18.90 - multi entry to all five museums, does not include special exhibitions. €20 to €47 - available for 2,3,4,5,6 days each with the option of travel zones AB or ABC. Reductions for over 200 popular attractions and activities. Does not include Museum Island. F. Berlin & Museum Island - Which Card or Pass for 2019? Having a number of different options for visitors to Berlin is a good thing. After all, a one-size-fits-all approach would not work. And that is why finding the right tickets/card/pass for you requires forethought and planning. Oherwise you will run the risk of not having the ticket you need and end up paying more than is necessary. Good for business, not good for you! Having tried all the options, the only two passes I consider for Berlin in general (besides the Museuminsel tickets and passes) are the Berlin WelcomeCard and the Berlin Pass. All others are simply selling the WelcomeCard with their own branding. As with all city cards and passes, there is no one right answer to the obvious question 'which is the best pass to get for Berlin?' The card that is right for you will almost certainly not work for the next reader of this page. Everyone wants to see and do different things. And this is why information on the various forums and discussion groups around the internet appears to be contradictory. Its not that the information is wrong, but rather that people are basing their opinions on limited experience, having bought one ticket, for their own needs. If they did not research their pass sufficiently, it was doomed to fail from the start, and the pass is branded useless for everyone. STOP reading other reviews now. Decide what you want to do, and work out which of the options presented above suits your needs. For example, on one two-day visit to Berlin all I wanted to do was visit a temporary exhibition in the Neues Museum and see as much as I could on Museum Island and in the city centre thereafter. For this I chose to stay at the nearby Radisson Blu Hotel, so no transport costs other than getting to and from the airport. The 3-Day Museum Pass at €29 and an extra charge for the temporary exhibition was all I needed. None of the other cards would have been worth my while. This scenario will certainly not appeal to many. For instance you might not have accommodation that close to the city centre, in which case you would need to add the cost of transport. You might want to see and do much more than the five museums on Museum Island. If you are staying for five days, you might want to consider a day-trip further afield, I recommend Potsdam. In this example, perhaps the Berlin WelcomeCard for 5 days with Transport for A, B and C zones and the 1-Day Museuminsel Pass would be better suited. Obviously I can not set out out each and every scenario, but each ticket does have the potential to save both time and money. For you to work out whether they are value for money, you need to look at what you want to see and do, and match that with the different options and their respective restrictions. That said, I offer a few observations based on my experience of these cards and passes. Berlin Welcome Card VS the Museum Island Welcome Card? The Museum Island Welcome Card includes 'free' entry to the five museums on Museuminsel and lasts for three days. The equivalent, three-day basic Berlin Welcome Card does not include these museums. Both come with the same transport options (i.e. zones A & B and A, B & C). The difference in price between the two (as of April 2019) is €17, but the benefits of the Museuminsel version are definitely worth more than that. For example, it costs €19 to get into the Pergamonmuseum. Museums Pass Berlin VS Berlin Welcome Card Museuminsel? Both of these tickets last are valid for three days. The Museums Pass only gets you entry to about 30 participating museums including the five on Museum Island. the card does not include special or temporary exhibitions. The Berlin WelcomeCard gets you 'free' entry to the five on Museuminsel museums, and discounts only to over 200 attractions and activities around the city. The difference in price is €17. I doubt your transport costs could be as much as that for three days. Do the reductions offered for the other attractions mount up to €17? If you want to see the Museuminsel five and a few others on the list of 30, probably not. If your hotel is near Museuminsel (and there are some good ones in the area) and if all the museums you wish to visit are on the list of 30, the Museums Pass Berlin is probably a good choice for you. The Berlin Pass VS Berlin WelcomeCard? The fundamental difference between these two multiple entry tickets is that the Berlin WelcomeCard offers discounted entry. For a number of sites and attractions included in the Berlin Pass, there is no further entry fee. As the Berlin Pass is considerably more expensive than the Welcome Cards, if saving money during your trip to Berlin is important, it is crucial you think about what it is you wish to see and do. Depending on what you want to see and do in Berlin in the amount of time you , it is very easy to save the outlay cost and more with a three day pass. Check The Berlin Pass website to examine further the calculations they have on saving money.